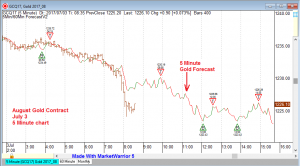 This article shows three days of forecasts for the 5 minute gold chart using the new forecasting model for the 5/60 minute charts. The picture below shows the button you need to click in MarketWarrior 5 to apply this indicator to a 5 minute chart. The button is labeled ‘5/60Min Forecast’. The first picture below shows the 5 minute chart for the August gold contract for July 3, 2017. 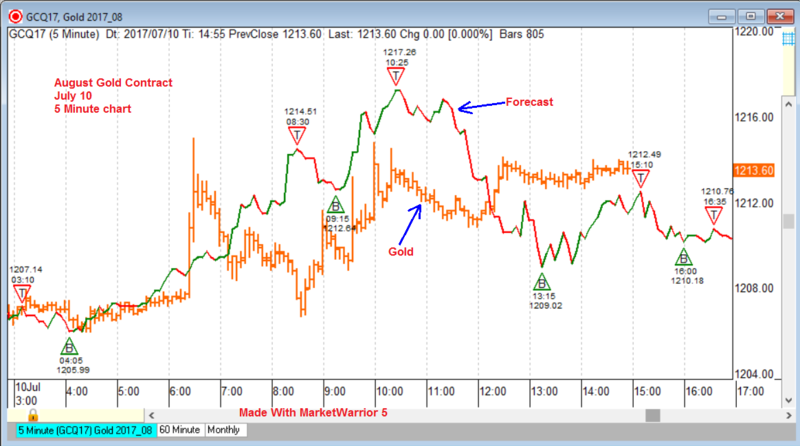 The red and green line is the forecast for the 5 minute gold chart. The triangles showing a T inside mark forecast tops. The triangles showing a B mark forecast bottoms. This forecast was calculated at 8:35AM, July 3, 2017. Here is the forecast result for July 3, 2017. The picture below shows the same forecast as seen above but now the data is filled in through the end of the day. 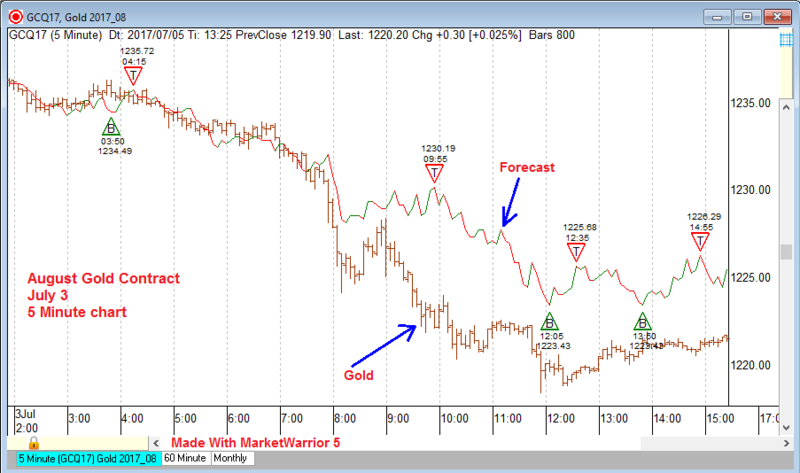 You can compare the pattern in the forecast line, and the 5 minute gold prices. 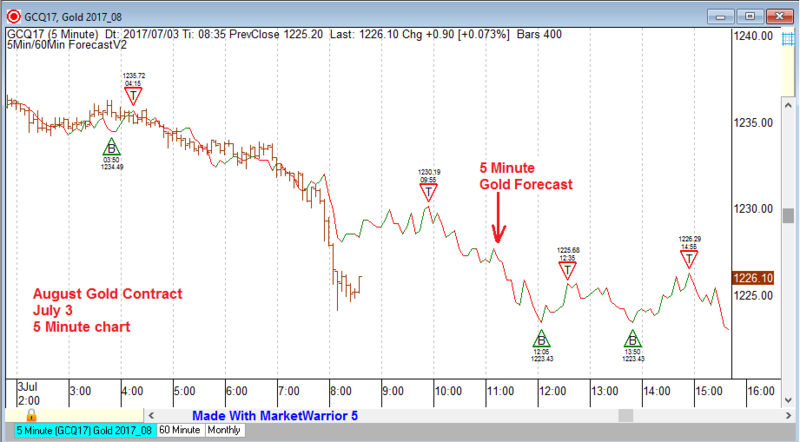 Here is a second example of the 5 minute forecast for gold. The picture below shows the August gold contract for July 5, 2017. The red and green line is again the forecast for the 5 minute chart. The forecast was made at 7:30AM, July 5, 2017. The picture below shows the same forecast as above, and now the chart data is filled in through the end of the day. When I am using this forecasting model I usually calculate the forecast just before and/or just after the main trading session starts. 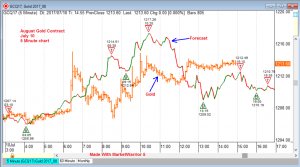 When the main trading session starts there is often a jump in volatility that can help the forecast cycle calculate more accurately for the remainder of the day. If the forecast is not accurate I recalculate at the start of a new hour. The forecast below was not recalculated and is the same as seen in the picture above. Here is the final example. The picture below shows the August gold contract for July 10, 2017. This is a 5 minute chart. The forecast was made at 7:35AM, July 10, 2017. The red and green line is the forecast for 5 minute gold chart. The final picture shows the data for July 10, 2017 filled in at the end of the day. This forecast was not recalculated but you can recalculate the forecast at any time during the day. 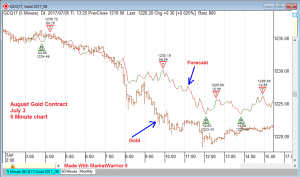 This entry was posted in Public and tagged forecast, gold by Mikula Forecasting Service. Bookmark the permalink.